An inquisitive young girl questions her grandmother about the science behind the colors of the sun and moon. With a forward by Spencer Christian. "Colors of the Sun and Moon" is the second book from the new multicultural, multilingual children's press, SundanceKid Press. The mission of SundanceKid Press is to promote cultural, ethnic/racial and linguistic diversity in children's literature. Each page includes the English text along with the Spanish translation. A free audio recording is available on the SundanceKid Press website. 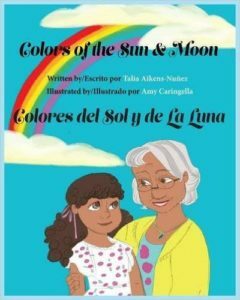 "Color of the Sun and Moon" uses a story about a young girl and her grandmother to discuss basic weather and color science. The grandmother and her granddaughter are of undefined ethnicity but speak Spanish and English. The book is written in both languages, including the forward, but fails to provide a pronunciation guide for either language so readers who aren't fluent in either or both have to fumble and mangle their way through. The text ends a bit abruptly; I thought at first that maybe a page was missing. It could have used a resolution or wrap up. The artwork is simplistic but with lovely colors. It nicely illustrates the topics that the grandmother and granddaughter talk about. Together with the text, the artwork introduces children to basic weather and color science, using simple easy to understand vocabulary. The book would probably work best for children of kindergarten age or older though younger children might enjoy the pictures. Looks like a cute educational coloring experience! It was cute, but not a coloring book. It's a nice book.